The WATER PASTEURISATION INDICATOR (WAPI) is a sealed tube with a special white wax (soy bean fat or brazilian carnauba wax) inside. The wax melts at 69oC (156oF) just above the temperature needed to pasteurise water, that is when your water is safe to use. The thermometer is a transparent plastic tube that has been crimped and fused at both ends using heat. Inside the tube is a small amount of wax which melts at 69 degres celsius. The rest of the is filled with air. The thermometer is placed in the water pot with the wax at the top. A metal ring slides along the tube to hold the opposite end of the tube at the bottom of the vessel. 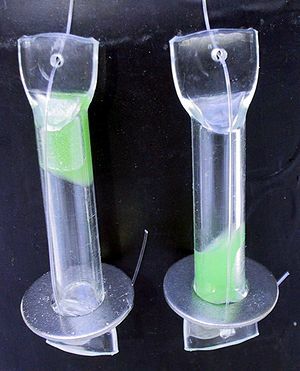 The air in the tube then acts as a float to position the wax away from the bottom. This is necessary since water at the bottom of a solar cooker may be very hot due to its contact the black heat absorbing tray. When the water has reached 69 degrees, the wax melts and falls in the bottom of the tube. This indicates that the water reached the pasteurization temperature. Dr. Robert Metcalf 1324 43rd St. Sacramento, California 95819 USA. This page was last edited on 10 December 2009, at 12:11.